Originating from South Asia, curcuma, or turmeric, is a perennial herbaceous plant and a member of the ginger family. It is particularly valued for its rhizomes (the underground parts) from which the yellow-orange spice is obtained. Though the spice is primarily known as a culinary ingredient, curcuma also has a number of health benefits. Part of Chinese and Ayurvedic systems of medicine for centuries, curcuma is traditionally used to stimulate digestion and treat digestive problems. It acts primarily by increasing bile secretion, thus facilitating digestion. As a result of its therapeutic benefits, curcuma has been the subject of numerous scientific studies. Researchers have succeeded in isolating the substances responsible for curcuma’s many benefits – curcuminoids – of which curcumin is the most abundant in curcuma and the best-documented in the scientific literature. Curcumin is recognised for its antioxidant and anti-inflammatory properties. As an antioxidant, curcuma helps combat free radicals, the reactive molecules responsible for cellular ageing. Given curcuma’s many properties, scientists are investigating its use in the prevention and treatment of a number of diseases. While results are still awaited, there is evidence to suggest curcuma may have a role in treating certain inflammatory diseases and arthritis. Other studies are also underway on the spice’s anti-cancer properties and potential for preventing some forms of cancer. Additional research is currently in progress which will hopefully reveal all curcuma’s secrets. Though primarily responsible for curcuma’s virtues, curcumin is generally poorly-absorbed by the body. 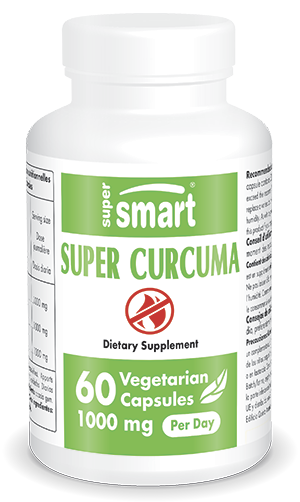 To improve uptake and absorption of curcumin, our dietary supplement Super Curcuma has been formulated to be 29 times more bioavailable than a traditional product. It thus enables you to take advantage of curcuma’s benefits with a recommended dose of 1 to 2 capsules a day. If you have any doubts, it is advisable to consult your therapist. See also our article 5 good reasons to consume turmeric.